FREE dog training clicker and FREE collapsible dog bowl: Use a clicker to mark pet's desirable behavior and build communication with your pet. 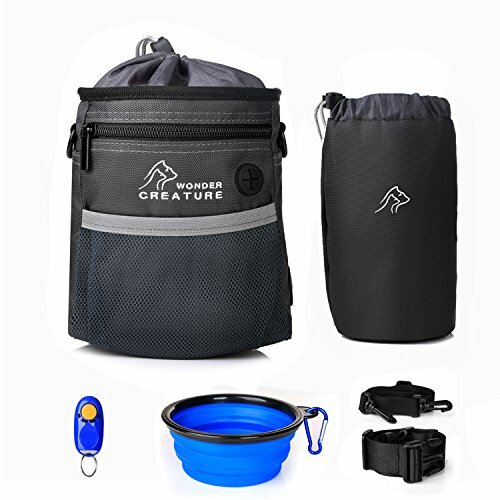 The collapsible dog bowl is easy to carry, and you can feed and water your dog anywhere. Safely store your smartphone, wallet or keys: put all your personal belongings in the zippered pouch or front mesh netting while taking a stroll with your dog. The zippers and drawstring keep everything secure even on the most adventurous of excursions. It's perfect for training, walks, trips to the park and more. If you have any questions about this product by Wonder Creature, contact us by completing and submitting the form below. If you are looking for a specif part number, please include it with your message.